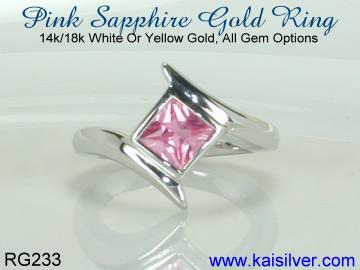 Since all the jewelry crafted by Kaisilver is custom made, we do not restrict your selection of design or gemstones to any standard set of sapphire rings that we maintain. However it is a good idea to review some of our gorgeous sapphire gemstone rings, this will allow you to understand the main features and elements of a well designed and crafted sapphire ring ... more. A good example of how a quality custom bracelet should be designed and crafted. This gold or silver bracelet from Kaisilver, combines fine workmanship and handpicked gems. With a metal weight of around 20-25 grams, the bracelet is designed to be long lasting and durable. You choose the gems, it is possible to combine different gems in the same bracelet ... more. 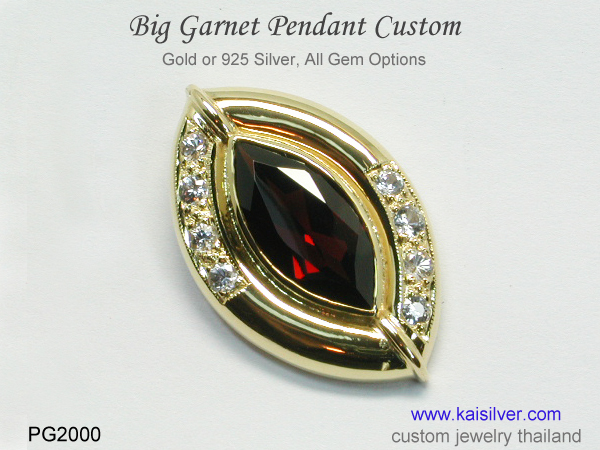 A stunning garnet pendant, a big red garnet centered in a finely crafted large gold or 925 sterling silver pendant. 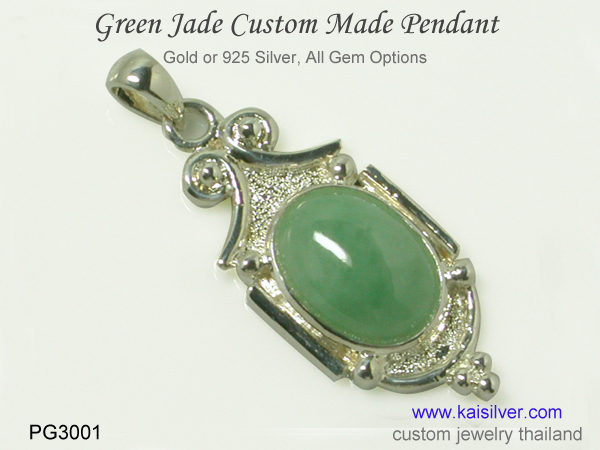 Kaisilver custom makes the PG2000 pendant with the gemstone of your choice. The jewel is perfect for formal or informal wear ... more. If you are looking for a men's size 15 ring, keep a few essential issues in mind. The metal weight of a ring should be optimized for its size, this will have a direct impact on the durability of the jewel. We talk about rings with a size 15 in our report ... more. Tanzanite the exotic and extremely rare violet-blue gemstone is found in just one small location on earth. The tanzanian beauty is considered to be 1,000 times rarer than diamonds. 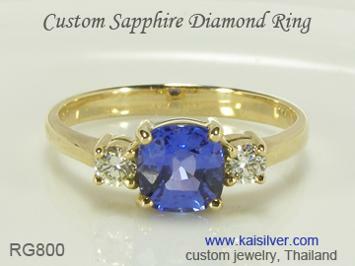 The Kaisilver tanzanite gemstone ring collection has some awesome styles for men and ladies. 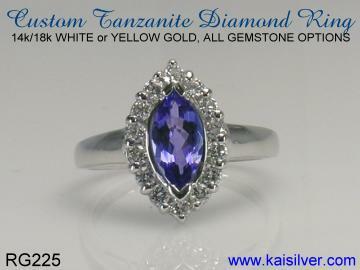 We can also craft your tanzanite gemstone ring with a design concept provided by you ... more. 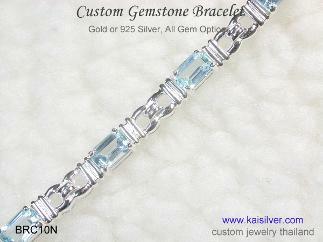 Kaisilver is the leading online custom made jewelry provider. We custom make gold and 925 silver jewelry with the same quality standards. Pick a design from our website or send us your own design images to be custom made. Get to know how we can help you get the jewel of your dreams ... more. A gorgeous custom made pendant, shown with a natural green jade gem. 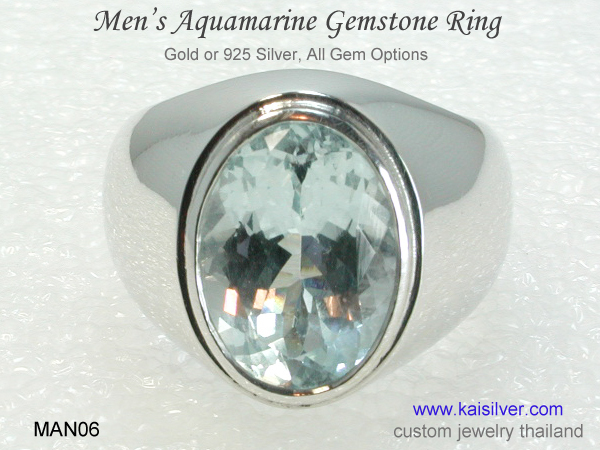 You can order a custom 925 sterling silver or gold pendant, with the gemstone of your choice. A classic design that will suit girls and women of all ages, read the full report ... more. The fascinating rutilated quartz gem takes center stage in this classic claddagh ring. The gem preserves the fine rutile needles for millions of years. 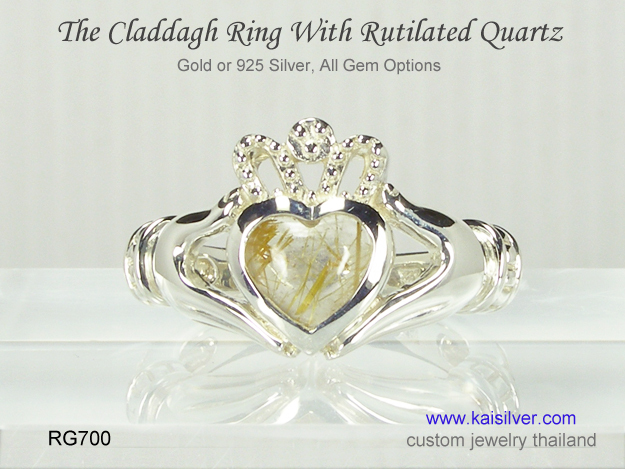 Kaisilver custom makes claddagh rings in gold or 925 silver with no limitation on gem selection ... more.